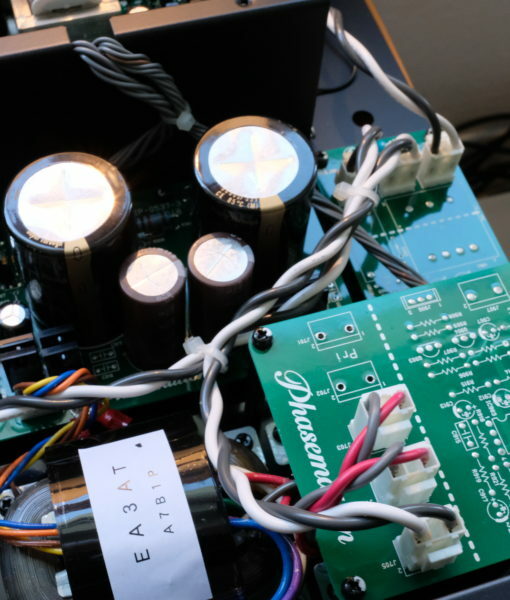 Phasemation released in 2002 there first line of products with a moving coil cartridge (P-1), a phono stage, a preamplifier, a power amplifier and even a passive attenuator. Since this first step, Phasemation as launched several lines of products. The EA-500 phonostage is born from a long process and was chosen to be launched now, in a time were analog market is more lively than ever. 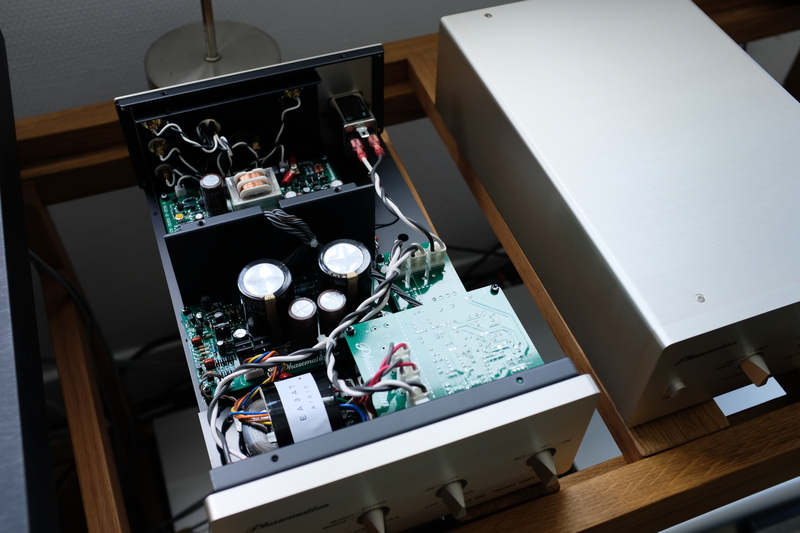 From the step-up transformers to the electronic circuits : all hase been built from scratch in order to set a new score in terms of sound performance and functions. 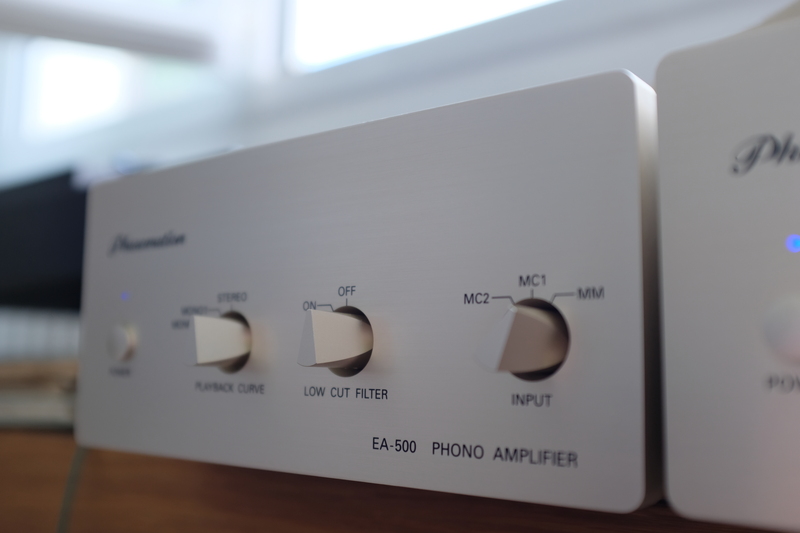 Phasemation, with the EA-500 simply wanted to make the best semiconductor phonostage in order for you get a new perception, a new feeling about your records. We have been using this phonostage for a few months now and are absolutely convinced by the performances produced with this new design which offers a superb sound as well as three RCA inputs (one MM and two MC) + two XLR MC input, RIAA equalization + two mono equalization curves, a sub filter switch (ideal with idler wheel turntables and warped records). It also uses a fully discrete non feedback circuit design with high quality components and it is certainly the key aspect to this excellent sounding phonostage. True monaural phonostage with fully independent left and right channel operation via two housing made of 12mm thick aluminum front panel, 2mm thick copper plating steel chassis base and a 2mm thick aluminum cover. This housing gives an assured stiffness and reduced magnetostriction. 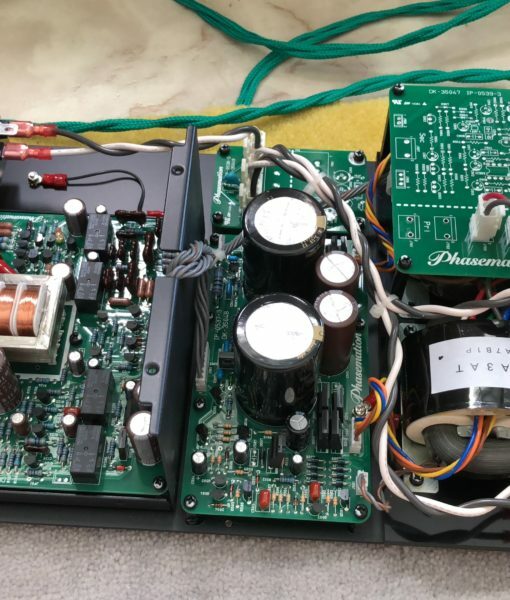 Furthermore, by splitting the sections of equalizers and power supplies of an amplifier in two distinct housings benefits to the S/N ratio therefore increasing liveliness and re-creation of a panoramic stage because of the high resolution induced. 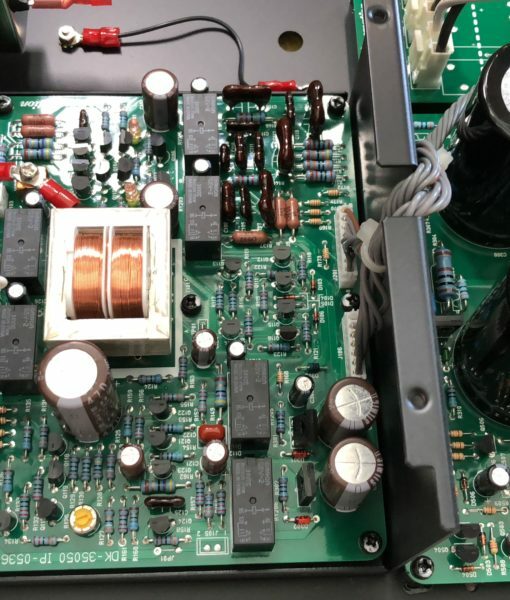 Newly designed amplifier circuits featuring V-I/I-V conversion and non-feedback for all stages with only discrete components. If negative feedback amplifiers are the most common type of amplifiers available using semiconductors or vacuum tubes, they proceed by always comparing the input and output signals and this difference (correction signal) is amplified as an input signal; thereby, realizing an an implicit time delay but also allowing an affordable electric amplification. However this time delay cannot be cancelled between the input and output signals and therefore generate a TIM distortion leading to the particular sound signature of all negative feedback amplifiers. All Phasemation electronics are composed of non-feedback amplifiers made of semiconductors or vacuum tubes. However, higher precision components and higher technologies with this kind of circuit topology. As a result, the signal of the audio sources (records) can be played 100% continuously and with minimal phase error. This insures that the music essence, soul, can be retranscriber to its full extent with uplifting-feeling sensation, dynamics, shading and so forth. 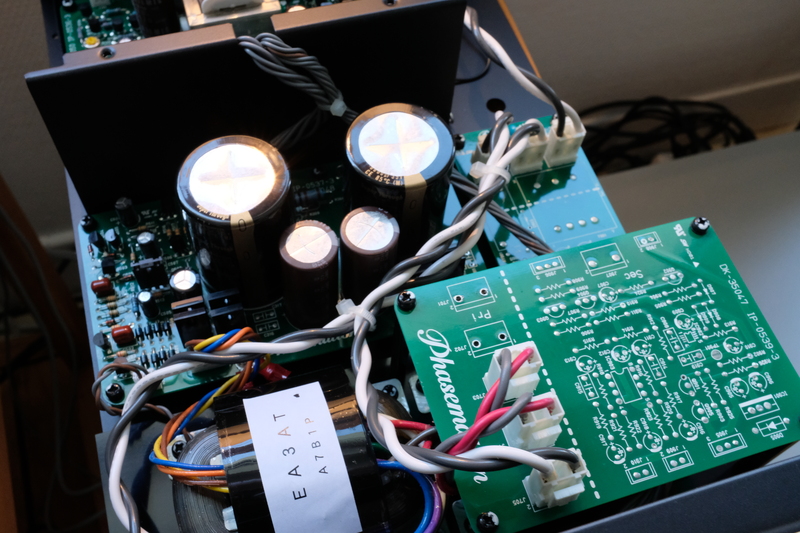 In the EA-500, the newly designed amplifier features the V-I/I-V conversion and non-feedback for all stages. All stages are composed of carefully-selected discrete components. The EA-500 converts the input signal into current, than performs the equalization to the signal to then return it to a voltage signal. Finally this signal is shared with cross-multiplying-buffer. Three inputs available (two MC and one MM) with three RCA input and two XLR MC input. The XLR input are true balanced input and use a new step-up transformer with a special divided-winding pattern structure. By using a non feedback low cut filter with CR2 steps (activated by relay switches), the EA-500 phonostage will allow you to play a warped record without audio quality degradation. 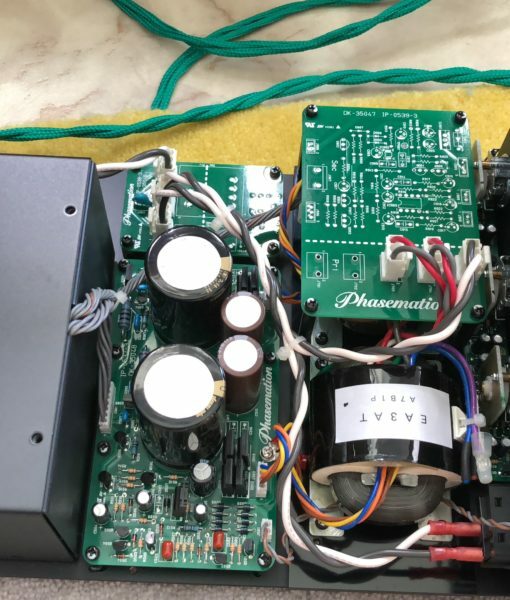 It will also prevent large woofer membrane excusion thus preventing your speakers to perform abnormal excursions (Xs value), inherently lower distorsions as well as protect your speakers integrity. Three different equalizations (activated by relay switches) are available. In addition to the RIAA standard, Mono 1position is to be used with records from the DECCA label and so forth and Mono 2 is to be used with Colombia label, thus allowing you to get the full extent of these wonderful recordings. 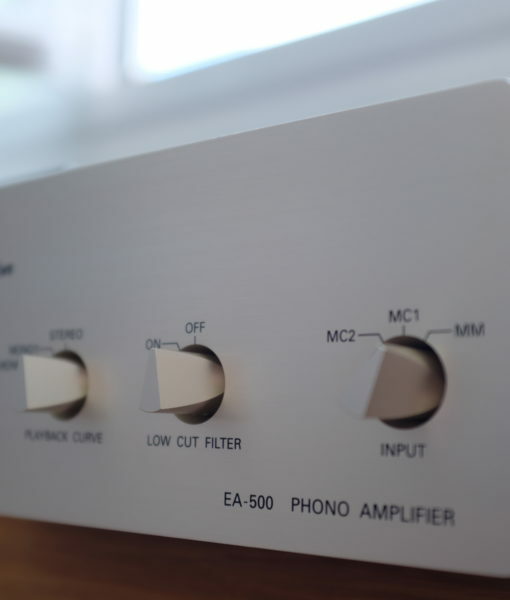 As the RIAA circuits are key points in the sound quality of a phono amplifier, Phasemation uses for the EA-500 well-established high quality audio components such as : 1% grade metal-film resistors, silver mica capacitors, etc. For the signal circuits : SILMIC electrolytic capacitors made by Elna and 1% grade metal-film resistors are mounted. The power supply circuits adopt SiC diodes made by Rohm with small switching modes noises thus improving overall sonic performances. 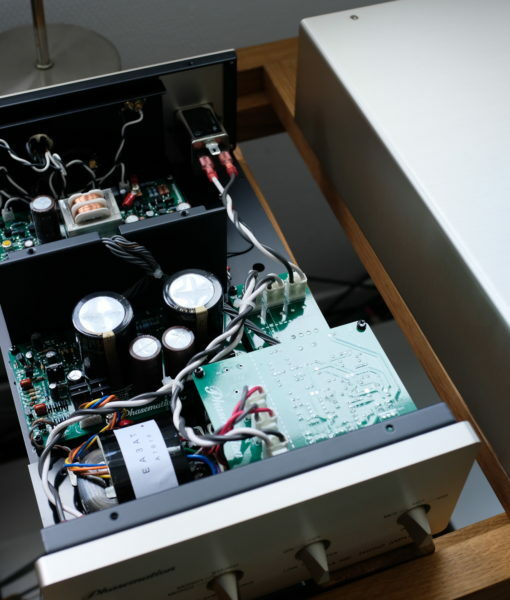 It also uses large High-End audio as rectifying capacitors. These capacitors use gold terminals on which low resistance electrode foils are plated (made by Nichicon). In addition cerafine capacitors made by ELNA are used as decoupling capacitors. 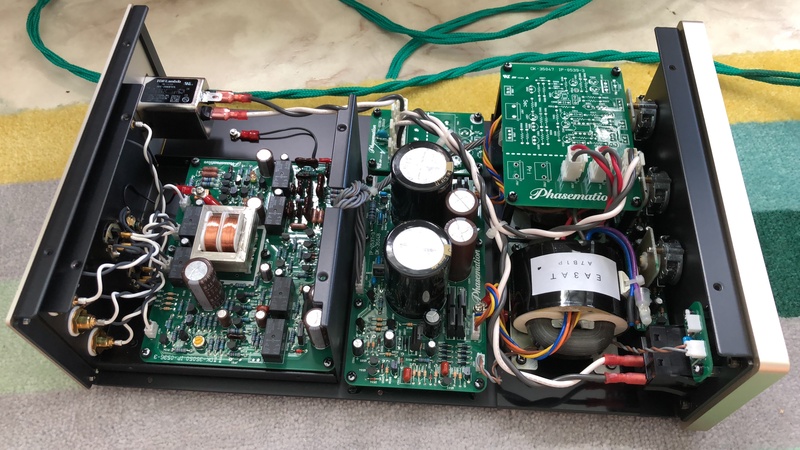 Even the power supply does not uses any feedback loop but instead uses high speed and extremely low noise circuits with a shunt regulator using low noise zener diodes. 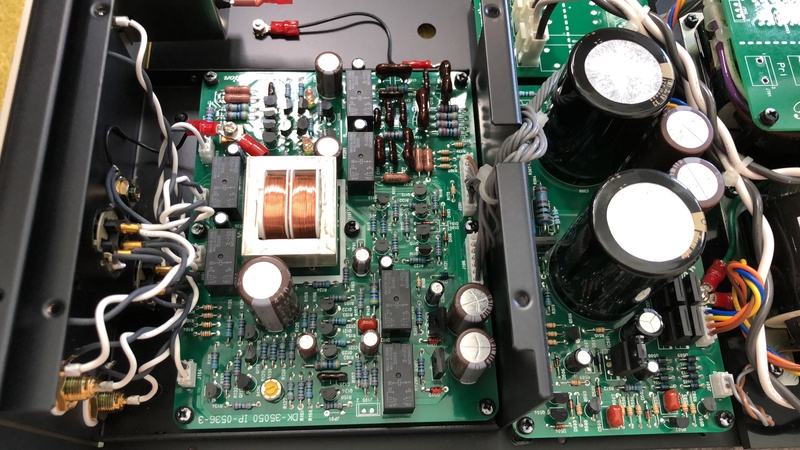 To cancel the negative effect of a common impedance grounding in the power supply, Phasemation adopted some low leakage flux R-core transformers and use there specificities for “+ power supply” and “– power supply” and by rectifying each bridge. The Phasemation EA-500 is a perfect match for Phasemation range of cartridges and this is how we first started to use it. Turning on both units of the EA-500 immediately makes you understand that you are using a High End phonostage. The powering phase starts by the blinking of the power led indicators that shows that the units are getting in function. After a few seconds a set of relays send the power to the phono stages themselves. 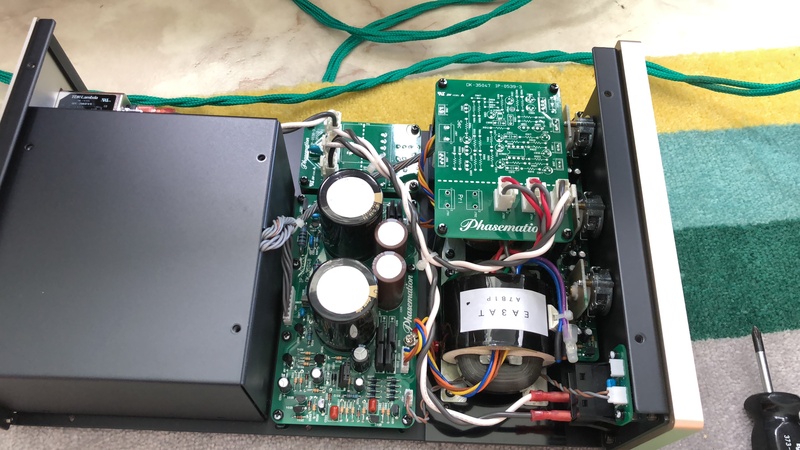 Dead silent, the switches to choose the playback curves, the low cut filter or the inputs are on relay and prevent any suspicious noises to be displayed in your speakers. We have been using the Phasemation PP-2000 on a long time period and we thought that we knew all about it but the EA-500 proved us wrong. With the EA-500 the Phasemation PP-2000 is even more fluid, more coherent and it seems that music is played effortlessly and with a real timbre and nuance respect. The soundstage is also one of the very strong points of this phonostage giving to the music an holographic aspect that gives to the Phasemation PP-2000 an even more addictive character. Bass structure is tight and detailed with a huge extension allowing the music to display a vivid and realistic presence. The MC stages are indeed compatible with numerous cartridges like, Lyra, Koetsu, Miyajima, Denon 103 and 103R and much more. We do not recommend extremely low output cartridges with the MC section but the MM section will allow you to use your favorite step-up or head amp for your special cartridge. We have the tendency to say that the most important part in a complete MC phonostage with MM input is the MM section. The EA-500 phonostage do has an excellent MM phonostage and we were surprised to hear the results with affordable cartridges like the moving magnet Audio-Technica cartridges VM-95ML, the VM540 ML and the VM-760. Listeners were absolutely surprised by the combination of these cartridges with Schick and Schröder tonearms and the EA-500. Spectacular sound that lead some of our customers to have more opened eyes on the MM range of cartridges. The EA-500 is in permanent demonstration at our Parisian showroom. Take an appointment with us and bring your cartridge(s) and records to discover it !